Wow I haven't vectored in a long long time... 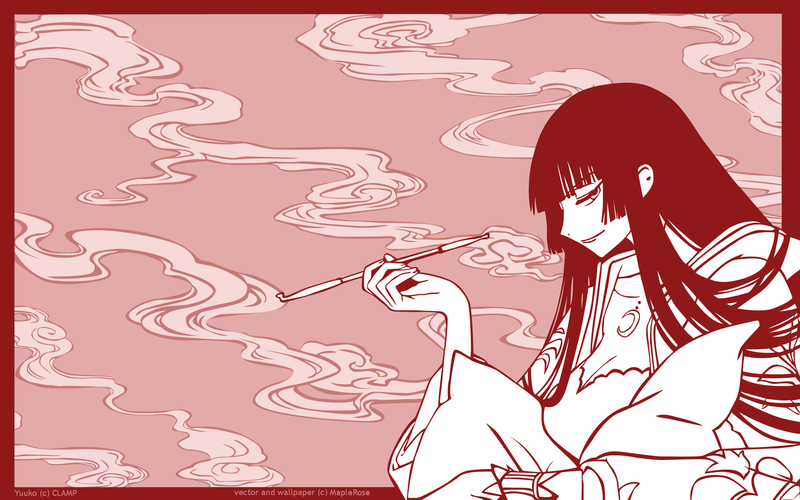 Anyway, decided to do an xxxHolic vector (my first one ^^) for a change, after seeing this vector on deviantART. And yes, this is wide-screen, because I want to be able to use it :) If you want non-wide-screen version, PM me or something. I love the colors you chose. Neat vector as well, great job! It is the atmosphere that is good with two colors mainly. o.O Wow, you vectored Yuuko... You've totally got my respects for that. Yuuko's hair is a nightmare, that's what I keep hearing from everyone who's vectored a picture of her. As for the monochromatic versions, I like the blue one best. Blue's my fave color ever. Talking 'bout black, i think it would be cool a black and white version. My favorite is the red with color version, although all three versions are really cool. Nice simple and clean, perfect for anybody who doesn't like overcrowded wallpapers. ohh it's rather red but very, very nice. Well done you! very nice... somehow, remember me of the "mushishi" anime... hehe... :D... and yes, wide is waaay better!